Much of the production of modern society is held together by means of adhesives, and without on-line inspection equipment, modern high volume production machinery can quickly fill a warehouse with improperly bonded scrap. Hot melt adhesive is probably the most widely used because of its solvent-free operation, high setting speed, and economy of use. With upwards of 100,000 hot melt “guns” in operation, there are many thousands of installations that can benefit from on-line inspection. Hot melt bonding power is a function primarily of hot melt quantity and temperature. The more adhesive applied, the greater the area bonded. The hotter the adhesive, the less viscous it is - it becomes better able to “grip” the substrate material. However, if the hot melt is too hot, it chars, forming a residue which plugs the injection nozzles of the guns. Nonmeltable contaminants also enter the melting system at times. These contaminants also eventually clog the nozzle or filters. Either way, the adhesive flow is blocked and poor product is produced. 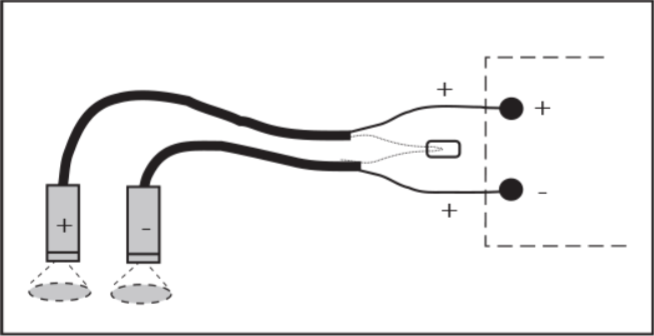 A pair of IRt/c’s, wired differentially (connect the minus leads together and measure across the plus leads) reliably detects the infrared energy radiated by the adhesive. This heat energy is proportional to the amount and temperature of the adhesive it sees, which in turn is an excellent indication of the hot melt bonding power. Wired differentially, one IRt/c will give a (+) response to heat, while the other will give a (-) response to heat. Fixture the (+) IRt/c to view the adhesive shortly after it is applied by the gun. Fixture the (-) IRt/c to view an area of the substrate in which there is no adhesive. 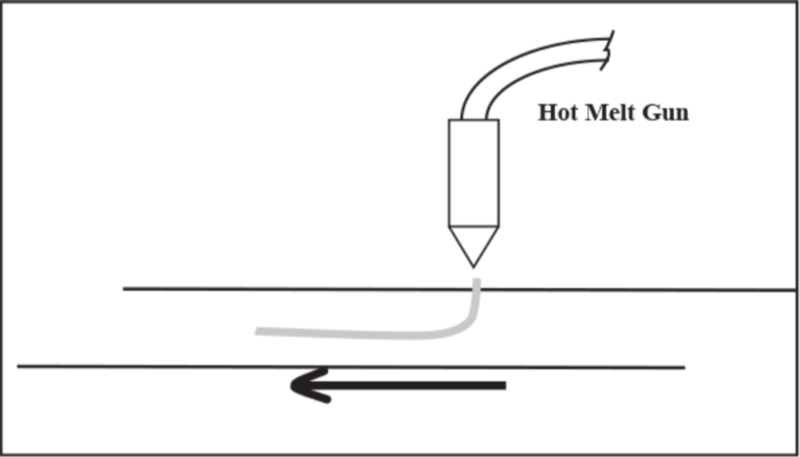 The (-) IRt/c is called the Reference, since it automatically compensates the (+) unit for any changes in substrate temperature, such that the net signal provided by the IRt/c pair is created only by the net heat of the adhesive being added to the substrate (the hot melt being applied properly to the carton, etc.). The Reference IRt/c is a very powerful tool. It can be located next to the (+) IRt/c for corrugated carton, on the under side of a plastic base cup while hot melt is applied to the top, or upstream of a coating head with the (+) downstream. 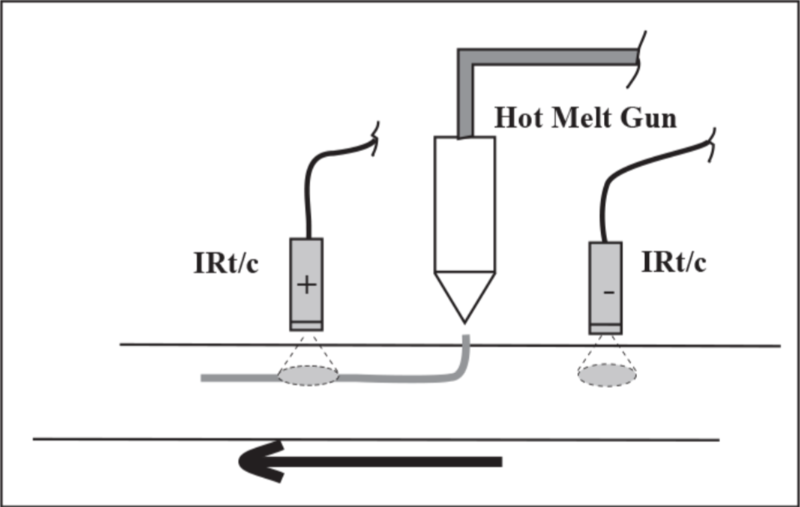 The differential pair of IRt/c’s will reliably report the presence or absence of hot melt compared to a reference area by the presence or absence of the characteristic heat signature. With set-up calibration, the pair of IRt/c’s will also indicate quantitatively how much hot melt is being applied. The IRt/c.3x is usually the model of choice due to its smaller tip, narrower field-of-view, and built-in air purge for dirty environments, but any of the IRt/c models may be used. The output signal from the differential pair is in the range of 1 millivolt for a typical set-up. Any suitable amplifier can be used. Since the IRt/c’s are measuring differentially, no cold junction compensation is required, and might cause errors if present. The amplified signal can be interfaced by computer, PLC, or other control device. Be sure to “design in” adequate sensitivity adjustment. For best performance, it is recommended that both IRt/c’s are mounted in a single aluminum fixture in order to minimize any thermal differences between them. Set up and operation involve fixturing the IRt/c’s at the desired inspection points, operating the adhesive applications at the minimum acceptable adhesive level, then adjusting the alarm limits to that level.